Mars is going to be closer than you think real soon. 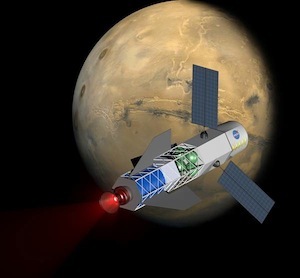 A team at the University of Washington is building a fusion engine that could get us to Mars in just 30 days! They’re doing super cool things like using solar energy to generate electricity that powers magnets to compress lithium or aluminum metal bands around a deuterium-tritium fuel pellet to initiate fusion. BOOM! That is so awesome. For comparison sake it took the Mars rover Curiosity roughly 8 months to make the journey to Mars. We’re for one are looking forward to rocking our home planet soon!